Doilies; they’re the one item that almost every home would have lying around, either sitting on table surfaces, stuffed into the pantry, or even hidden in linen closets. Whether crochet or made from paper, you’ll be pleased to know that these little items can be used in a whole array of clever and crafty projects! The following doily craft ideas & projects will teach you how to make everything from home decor and clothing to party decorations and accessories, all using the humble doily! 1. Want to make beautiful doily earrings just like these by 30 Minute Crafts? You’ll be pleased to know that this tutorial will help you create these fashionable accessories in less than 10 minutes! 2. The sisters behind blog A Beautiful Mess sure are creative and you’ll be very happy to find out that you too can replicate their DIY doily lamp shade by following their simple step-by-step guide. This is the perfect afternoon activity! 3. Have you got a number of lovely, vintage doilies stored away in your cupboard or craft box? A Few Pretty Things has turned her beloved doilies into wall art and you can too by checking out her fun and inexpensive tutorial! 4. 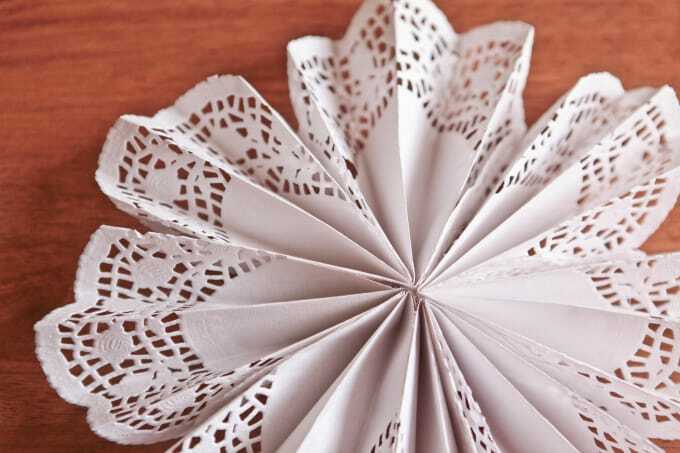 Paper doilies cost next to nothing to buy from a Dollar Store or even your local supermarket, but what you can do with these humble objects is nothing short of amazing! Turn your paper doilies into spectacular flowers with this handy guide from Amanda Coleman Designs. 5. Arte A Scuola is a lover of all things creative and crafty at heart! Follow her genius tutorial in order to create your very own doily imprint clay soap dishes. These are seriously pretty! 6. This amazing DIY project idea from Ashley Ann Photography is perfect for a vintage-inspired wedding, or even simply for your own home! By sewing her favorite doilies together, Ashley was able to create this unique table runner that you’ll love. 7. Jazz-up your denim shorts with some crochet doilies to add a stylish and vintage element to your outfit. Clones n Clowns has created this simple tutorial so that anyone can turn their plain denim shorts into doily-clad perfection! 8. This doily quilt cover is incredibly beautiful and very easy to make thanks to these instructions from Craft Ideas. This project is a perfect way to turn your doily hand-me-downs from a loved one into something special that you can keep on your bed every day. 9. Everyone loves mason jars, but how about you turn your common little jars into doily-covered candle holders, just like Crafts By Amanda did? Not only does the crochet doily pattern look beautiful when glued onto the jar, but the candle’s light filters and flickers through the holes in your doilies, giving the jars an ethereal glow. 10. Let’s face it, dream catchers just look a whole lot prettier when they feature a doily in their design. Darice has created this super simple guide to creating this very beautiful doily dream catcher. You’re going to love this one! 11. Doilies and clay go together like peanut butter and jelly – It’s a total match made in heaven! Dishfunctional Designs has made these lovely little Christmas decorations using the imprint of a doily to give it that ‘lacy’ pattern, before painting her star in a dashing shade of blue paint. 12. Create the perfect space for your earrings using your favorite doily and a picture frame, just as Weibo has done. By hanging your earrings on the framed doily, you’re not only keeping your earrings paired together and safe from disappearing, but you’ve also created a very pretty showpiece for your bedroom. 13. If you’re seeking a showstopping, hanging light piece to decorate your space (but happen to be on a tight budget), look no further than this amazing tutorial by Emmmy Lizzzy! 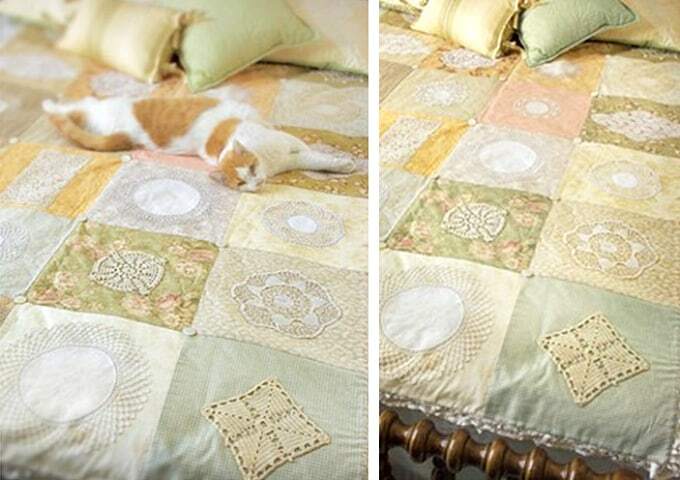 Using doilies from your own collection or a thrift store, you too can create this stunning masterpiece. 14. For those of you who love creating handmade and creative cards, you’re going to love this DIY idea from Fab Art DIY. Using a paper doily, you can create this perfect and three-dimensional floral bouquet design! 15. Flea Market Trixie sure knows how to create eye-catching works of art using little more than your treasured doilies and some old frames! You’ll love the vintage-inspired aesthetic that this project adds to your space. 16. It just wouldn’t be a DIY doily project round-up without a tutorial for these famous doily bowls from Free People! These are not only very simple and fun to make, but they are also super useful and can be used to showcase jewelry, hair accessories, Polaroid photographs, crystals…The list goes on! 17. For you super creative crafters, this tutorial from Free Pretty Things For You will teach you how to turn your circular doily into an actual clock! This project is both useful and stunning. 18. Add intrigue and a unique design to your otherwise boring stools by giving them a doily makeover! Glimmer and Grit teaches you how to achieve this pretty effect in just minutes. 19. 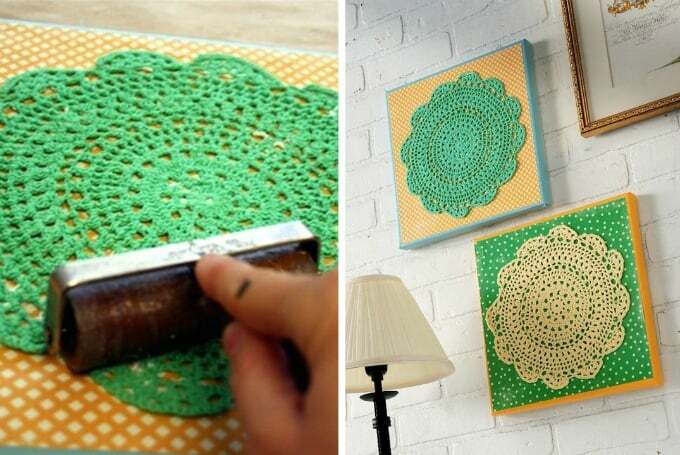 This creative cushion makeover by Good Housekeeping incorporates the humble doily into its design. The result is both simple, yet stunning, and the good news is that you can also achieve this crafty idea in little to no time! 20. You can also use doilies to customize your pen holder, just as Hello Nicabella has done! Follow her simple instructions and before you know it, you too will be showcasing this clever office idea. 21. Doilies can also be used to create intricate and eye-catching hanging plant holders! Home Edit shows you how it’s done, so follow this step-by-step tutorial and your space will quickly be transformed. 22. Does it get any cuter than this? I Heart Nap Time has come up with a brilliant idea in order to create this watermelon bunting from inexpensive paper doilies. This one is perfect for any upcoming children’s birthdays! 23. We’re sure you’ll agree that these pastel dyed doilies are incredibly beautiful! This can easily be achieved in an afternoon and is a wonderful DIY project idea for any brides-to-be. Follow Intimate Weddings’ guide to achieve this look! 24. Intimate Weddings has done yet another great job, this time involving paper doilies as cupcake wrappers! This is another wedding-perfect project, but these can also be used at birthdays, engagement parties, bridal showers, or just about any other event that your heart desires! 25. What a genius idea in order to transform a basic tank top! Katrinshine shows you how to add a beautiful bohemian look through following her DIY tutorial. Here’s a tip – Circular doilies definitely work best for this one! 26. You may have seen doily-covered mason jars before, but did you know that they look even more wonderful when you use colored crocheted doilies? Glue your doilies on in random places around the jar to create an eclectic look, just as Katrinshine has done. 27. Pin wheels never looked so pretty! Use store-bought paper doilies and follow this easy-peasy tutorial from Kojo Designs to create this fun project which is perfect for both adults and kids alike. 28. Who would’ve thought you could use a doily as a template to wash over with some watercolor paint and create a stunning design? Kollaj shares this very creative tutorial in order to help you achieve beautiful artworks just like this one to decorate your home with! 29. Detachable collars are wonderful accessories as they can quickly add a whole new, vintage-inspired element to an otherwise plain top. Leafy Tree Top Spot shows you how you can quickly create a doily collar just like this one! 30. Embrace your inner designer and makeover a simple circular mirror by incorporating paper doilies into its edges! Life Flix describes how she made this clever project and you’re sure to love her idea.